As an long time iPhone user, I have heard a lot of positive comments on Android smartphones, especially Nexus 6, which is the best stock Android phone on the planet. I was really shocked once I received the device because of its big screen and the material design. And I felt I just made a good choice on that. However, iPhone and Android are completely different operating systems, meaning even the same thing may act differently on each device. So it takes sometime to prepare for the transition. In most cases, the smartphone is worthless when there are no contacts or photos on the phone as it's a must for basic tasks and important apps. So the very first thing I have to do is to transfer content (contacts, text messages, music or photos) from my iPhone 5S to Google Nexus 6 to make it work. But it took me 10 minutes to manually type 10 contacts to the new device, which seems not a good option for the task. Luckily, I found out an automated solution to get the job done in just a few minutes. 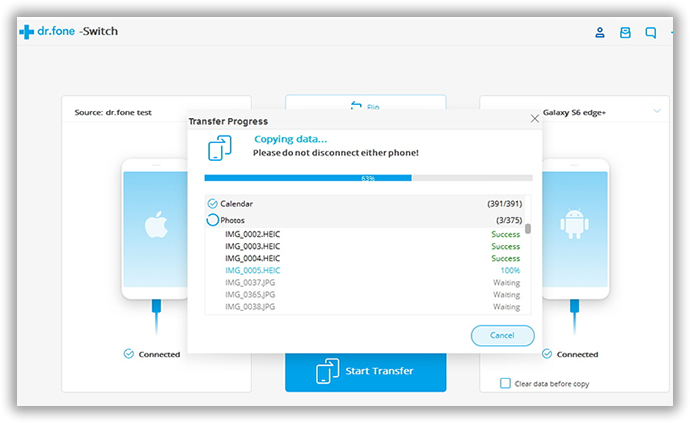 Androidphonesoft Phone Transfer is a personal digital assistant that can help you move several types of content from one mobile phone to another automatically. All you have to do is just a few mouse clicks, and then the rest of work will be handed to the software. What's more, it works on all major mobile systems, such as iOS, Android, Symbian and Blackberry. All my 500 contacts, 100+ music and 300+ photos got transferred to Nexus 6 within 10 minutes. Wow, how fast the speed it is. Think about how much time it may take when you do it by your hands. Simply click the download link above and install the program on the computer with the built-in wizard. The good news is that this program supports both Windows and Mac machines. Open the program when installation is completed and click "Switch". After that, it asks you to connect your smartphones to the computer. Use the USB cable to connect the smartphones to the computer. Once it was well connected, the program shows the device name on the main screen. If not, please make sure both USB drivers are installed correctly on the computer. The program will automatically detect the devices once well attached. After that, it will start the scanning process to find out data stored on both devices. The program will make a deep scan on the original device to see what kinds of files are stored on it, and then select the items you'd like to copy from one device to another. In default, it will transfer all of the items. However, it will take much more storage on the new device. 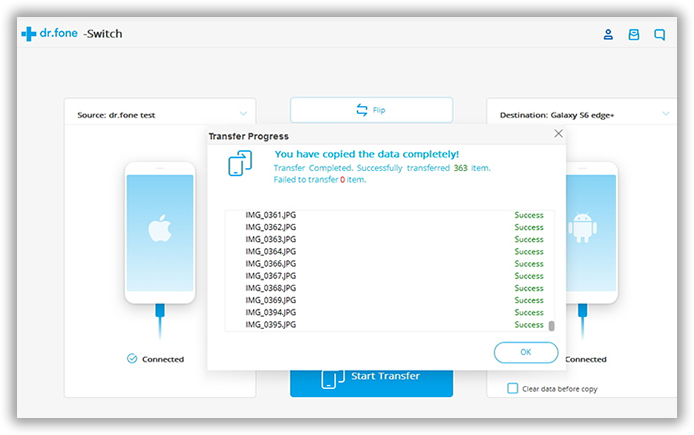 After selection, click on the Start Transfer button to start the transfer process which should be done within 10 minutes. I have helped my friends and myself several times when we got a new smartphone and in need for a quick transfer. It's really fast and user friendly. You can feel the enjoyment especially when you have a hard try on manual transfer before. 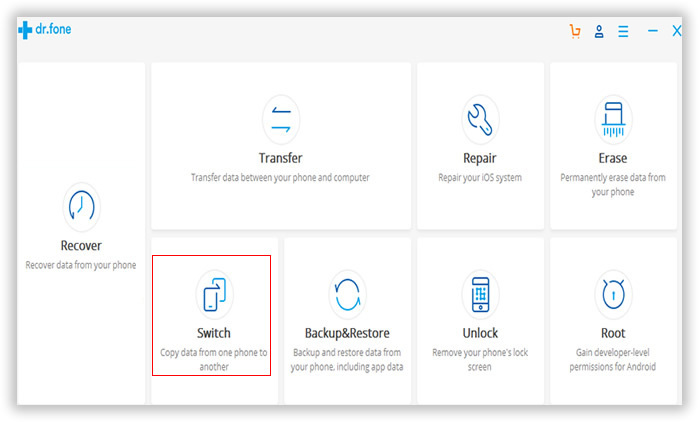 Besides data transfer between different mobile phones, it's also capable of backing up your smartphone data. And restored the device from backup when some bad thing happened. I highly recommend this program for everyone who owns a smartphone!